Despite the bitter cold, countless hours of nightfall, numerous wet socks, and weeks spent deathly ill from the common cold… I’ve been trying to make the best of my winter so far. 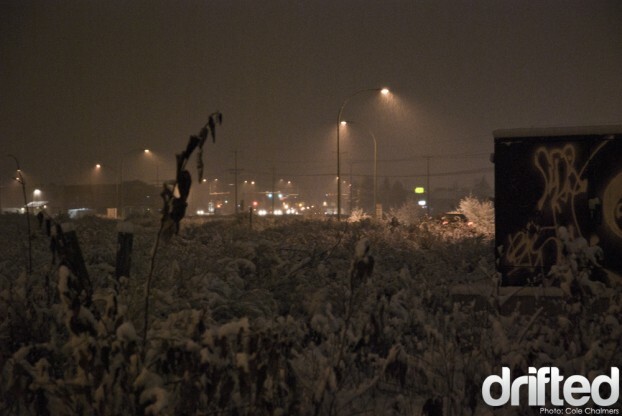 I’ve logged a ton of hours polishing my drifting skills on Forza 3, but even better than leveling up online, we’ve been applying that E-seat time to real life seat time; in the very forgiving and helpful snow. 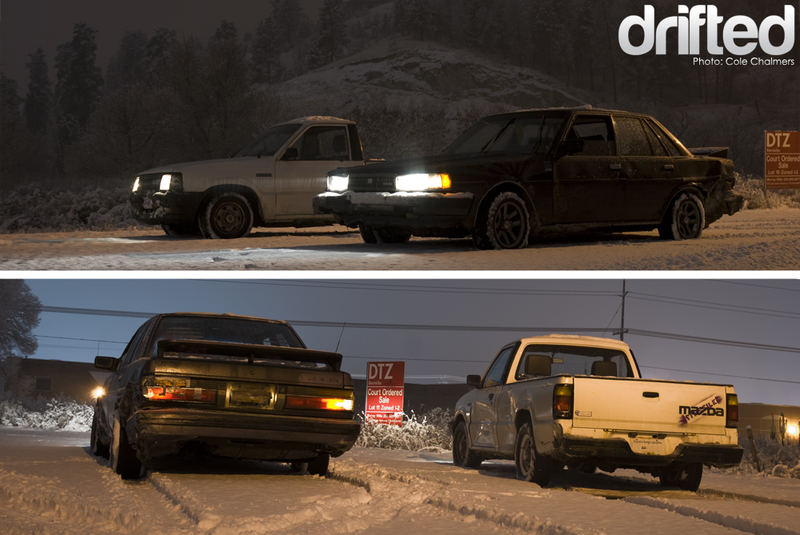 As soon as the white stuff hits the ground, winter beaters become drift machines! My daily driver Cressida sedan gained missile status by the end of our first outing, after a ‘bit too aggressive’ barrier tap. Shawn Brown (Drift Union) and I spent the next couple months practicing tandem runs, banging off of each other (sometimes by accident, sometimes not so much) and plenty other snow drifting shenaningans. We meant to make a video but we were having so much fun we forgot to film half the time! 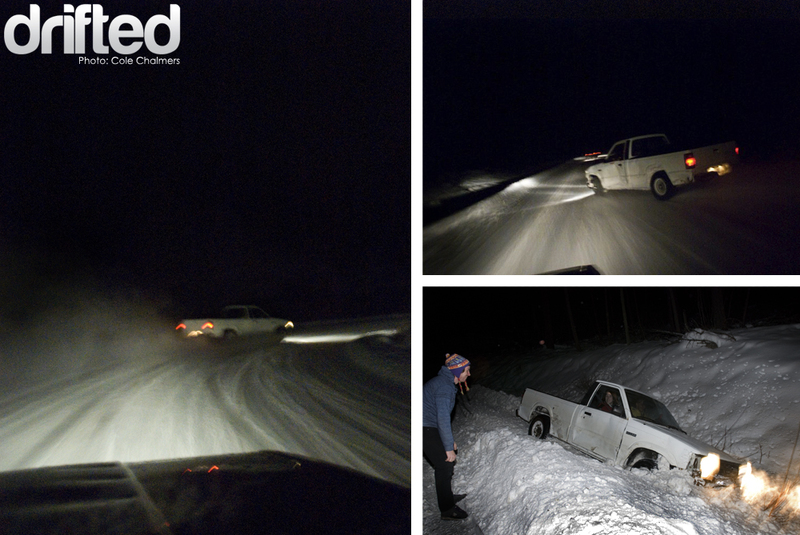 The snow play-time was cut short though, Shawn’s B2200 suffered a smashed window (among other things) that put an end to driving in warmth and comfort, and the authorities decided my car was unfit for public roadways and had the car removed from the road. It was a sad day, but it was a long time coming considering how beaten up it had gotten. But its replacement is a prime candidate for more winter abuse… I joined the s13 club, we’ll see how long it lasts. 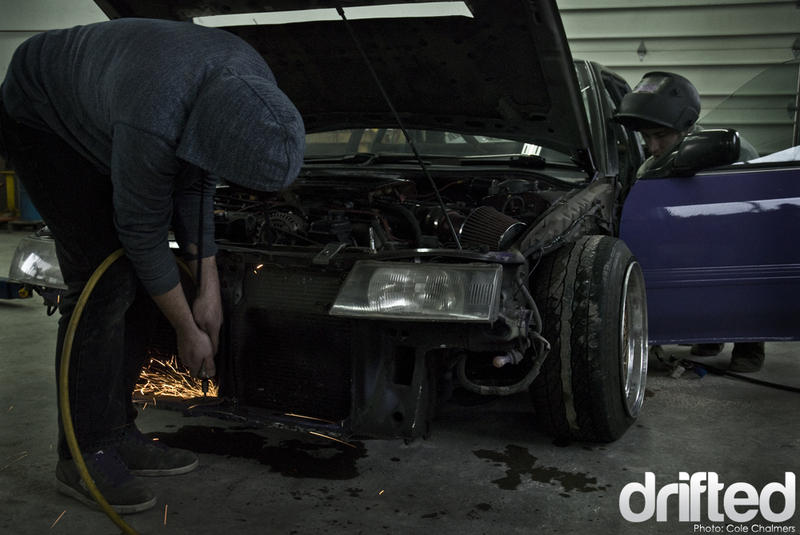 While some of us are out wrecking cars, most people use their downtime to fix and build their cars for summer. I can tell you right now that some big things are going to be coming out of the Okanagan this year. A few top quality cars came onto the scene last year, and everybody has stepped up their game a notch to keep things interesting. 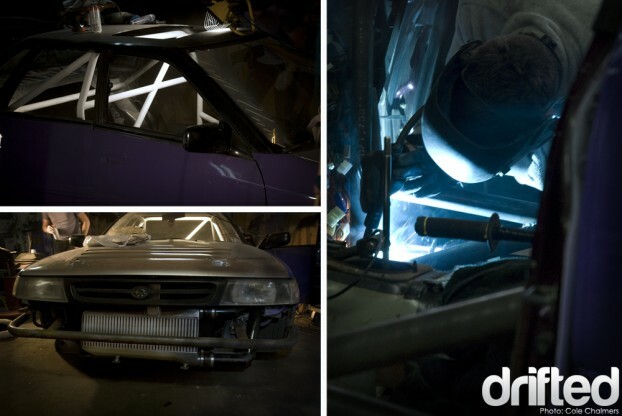 The Drift Union boys all got their purple cars caged up to be ready to compete in Pro-am this season. Logan Noel’s Subaru Legacy also went front mount and Shawn Brown’s FC picked up some gangsta new shoes, and both cars have got a few more power upgrades and new (read: loud) exhausts. 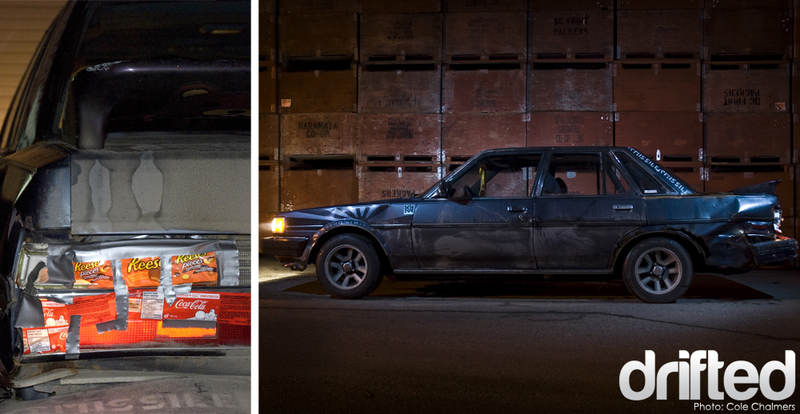 On that note, if you know these two cars are coming to an event near you, bring earplugs… or it’s gonna hurt. 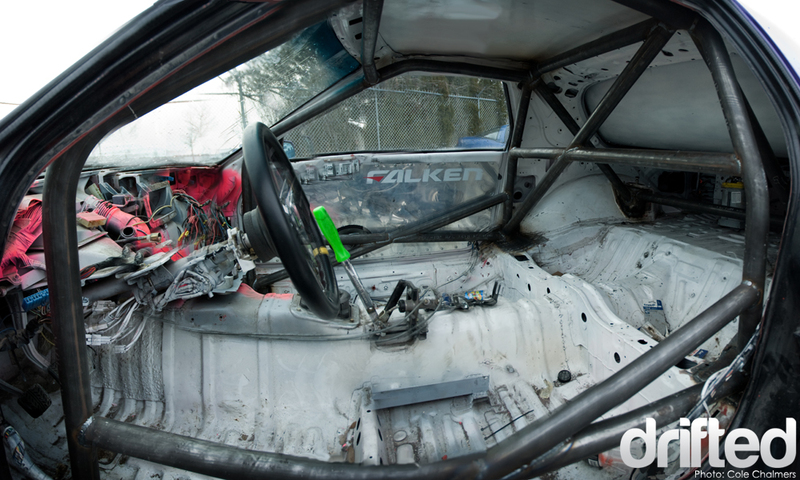 Gavin Johnson decided to part ways with his RB20 powered s13 this winter and is in the process of making one beauty of a car with a beast for an engine. 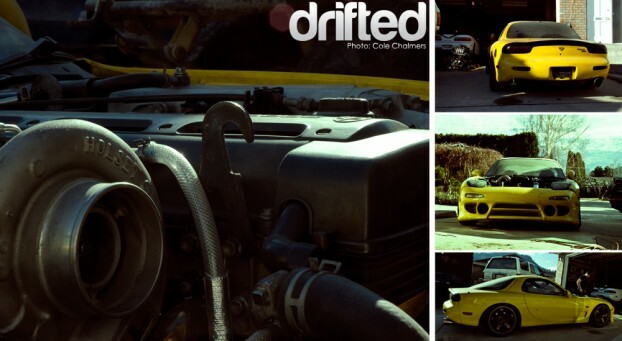 He picked up an FD RX7, tossed the 13brew, and stuffed in a 2JZ. It’s got a ways to go still, but I can’t wait to see/hear this thing at wide open throttle at the track soon. Street sweepers were out this week though, and that can only mean one thing! Summers coming… real fast.